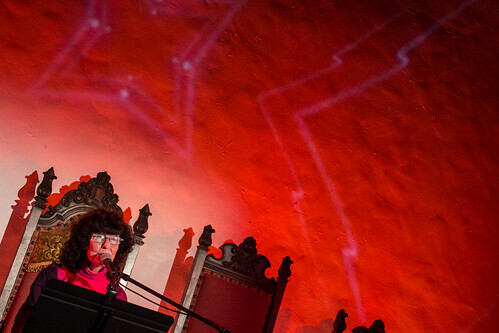 The large white wall of the Masonic Lodge at the Hollywood Forever Cemetery canvased a row of medieval like chairs at its base where Linda Perhacs and her band gave a transcendent performance. Between songs from her excellent 1970 Parallelograms and her recently released follow up The Soul of All Natural Things, the beloved folk singer would give an anecdote set to ambient instrumentals about the origins and history of the following song. Her stories range from her song “Hey, Who Really Cares” being sampled by the Notorious B.I.G to having a song in the Daft Punk film Electroma. Other discussions mentioned Björk music videos, Julia Holter, and the consciousness of light, which was beautifully used throughout the show to paint the large white wall with different temperatures and shades of blues and reds. Early on in the set, a dancer joined in, starting at the back of the venue, then contorting and twisting her way to the front of the stage to the accompaniment of Linda’s music. Jim Camacho opened up the show with his passionate and personal acoustic guitar and piano numbers that comforted the audience in their seats. Linda Perhacs can be seen this Saturday in Pioneertown and across the UK this summer, as well as at this years Primavera Sound Festival in Spain. Her first album in 44 years “The Soul of All Natural Things” is available now.